CFEngine Enterprise 3.0 offers Effortless Provisioning, Continuous Maintenance and Integrated Analytics. 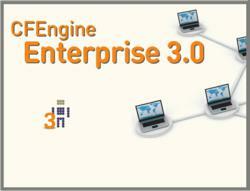 CFEngine Inc. announced CFEngine Enterprise 3.0 at LISA’12, the annual System Administrators Conference by Usenix. The product is based on CFEngine Community, the world’s leading open source configuration management software – adding special capabilities needed for enterprise use. First introduced in 2009, CFEngine Enterprise today automates large-scale IT infrastructure at leading organizations worldwide in banking, ecommerce, hosting and government, with deployments of tens of thousands of servers and more. Integration with Design Center 3.4: Deploy and configure infrastructure of any scale using the templates and tools provided by Design Center, or extend the library with configuration management policies specific to your organization. Enhanced support for Application Servers: With improved support for orchestration and XML, it is easier than ever to provision and manage the configurations of a wide range of application servers. Enhanced platform support: In addition to the platforms supported by CFEngine Community, CFEngine Enterprise 3.0 supports Windows, Android, and a range of storage and network devices. Continuous maintenance and real-time reporting: CFEngine Enterprise’s agents execute their policy checks continuously to maintain the systems configuration in compliant state at all time. The new Event Tracker shows any drifts from compliance and repairs executed by CFEngine in real-time. Performance and scalability: CFEngine Enterprise captures vast amounts of data generated by all agents’ activities in a centralized database. It supports monitoring, analytics and compliance reporting for up to 5,000 nodes per CFEngine management server. Analytics Applications: The ‘Mission Portal’ of CFEngine Enterprise provides System Administrators with detailed information about the actual state of the IT infrastructure and how that compares with the desired state. SQL Reporting: In addition to improved REST API’s, version 3.0 adds a SQL interface to its database, so users can easily create and schedule reports to match all their needs. At CFEngine, our mission is to help people manage a world of smart infrastructure. We enable CFEngine users to become agents of change and innovation, and not have to constantly fight IT bottlenecks and outages. Our lightweight and de-centralized architecture lets engineers build and manage IT operations of any scale and complexity. Our continuous configuration management ensures that IT systems do not drift and are always maintained at - or converging to - their desired state. For more information, please visit us at cfengine.com.